Are you a responsible job-seeker who loves working with customers and enjoys maintaining order in a frequently chaotic world? Being a bank teller might be the perfect position for you! Our bank teller resume example and three expert writing tips are great resources for getting started on the path to employment. If you feel a bit lost, our comprehensive how to write a resume guide will help you get the ball rolling. Or, if you’re strapped for time, try out our easy-to-use resume generator and create one in a flash. Want to see resumes from other industries? Explore our resume database. Not your favorite resume design? Find a resume template that you love. If you need additional help, check out our expansive cover letter collection for tips to help you craft yours. Get that teller resume looking sharp with our three expert tips! Landing a job as a bank teller is great because it’s respectable work with a decent salary that requires no experience (although experience is great too). If you have no experience, how do you set yourself apart from other candidates? Easy: prove how responsible you are. Give examples from school where you were responsible for organizing group activities (field trips, assemblies, sporting events), working as part of a team (athletics, debate, matheletes, etc. ), or even more relevant– handling money! Bank tellers will handle more cash in one day than most people touch in months, so it’s critical to hire trustworthy individuals. If the hiring manager has faith in your character, that’s a huge step toward getting hired. Put yourself in the shoes of the hiring manager: does this achievement strengthen the overall resume? Your first bullet needs to be strong because it’s the first thing a hiring manager learns about you (other than your name and contact information). Outlining your work experience is a surefire way to get things off on the right track, because it proves that you are capable of handling the responsibilities of a teller. Bullet number two is also significant because it’s your chance to set yourself apart from other applicants. In which area do you particularly thrive? Are you great at calculating data or are you the person everyone turns to when there’s a problem? In our example, the applicant is particularly talented at working with customers. Now that you’ve asserted yourself as an experienced candidate with an area of special strength, it’s time to lay out the toolset: think of your key work skills and write them down. Are you bilingual? Are you proficient with any pieces of software that make you a better bank teller? Do you have skills as a leader or a public speaker? If you are struggling to fill in this section, check out this awesome resource to find skills worth learning or ones that you may have forgotten about that apply to teller work. The fourth bullet point, which can be extended to a fifth bullet point if needed, is the cherry on top of your resume profile. This is where you highlight a relevant career (or academic) achievement that proves your ability to succeed as a teller. It could be an award you won while working for a previous company, or it could be a milestone you reached as part of a team. It could also be smaller accomplishments (as long as they pertain to being a teller), like never making a mistake counting your cash drawer or never being to work late. Put yourself in the shoes of the hiring manager: does this achievement strengthen the overall resume? If you can’t think of anything at all, it might be wise to try a career objective, which is the go-to intro for people joining the workforce. If you don’t have experience, never fear! Give examples of times you’ve patiently handled a situation — in school or as a volunteer. Bank tellers have a large list of responsibilities, many of which can be quantified (counting money, using computers, following strict procedures, etc). At the end of the day though, taking care of customers is near the top of this list in terms of importance. People who tend to be more tech savvy don’t spend much time in the bank these days, which means the customers going into a bank are often elderly or distrusting of technology. Having the ability to connect with these customers with patience and kindness is key. 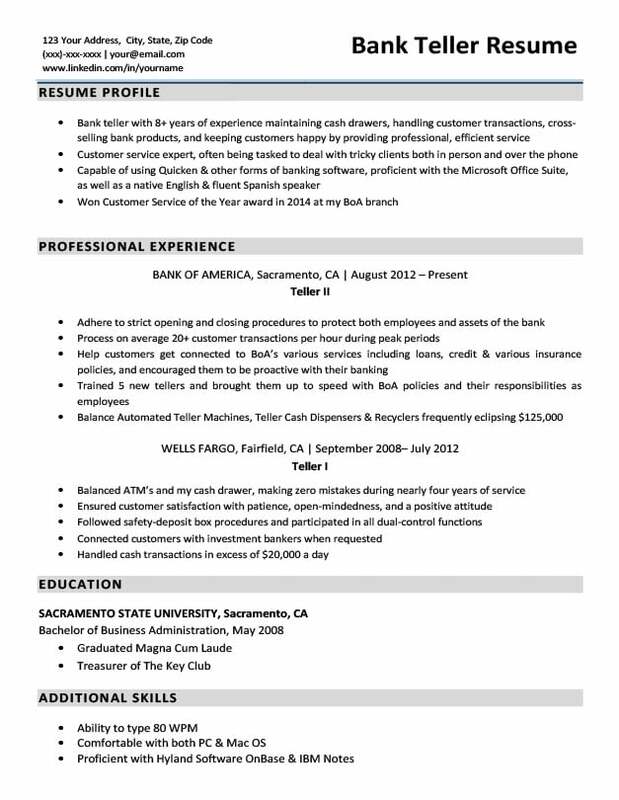 Customers and customer service interactions were mentioned in our bank teller resume example multiple times. If you don’t have experience, never fear! Give examples of times you’ve patiently handled a situation — in school or as a volunteer. No examples? It’s never too late to go out and volunteer at your local senior community center or elsewhere in your city! Ready to get things started? 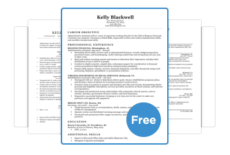 We have a large number of free downloadable resume templates for you to check out. If you’re crunched for time, our resume generator can help you construct your own resume in minutes.